Troops set up concertina wire as a Customs and Border Protection agent stands guard on the U.S. side of the border with Mexico, on Thanksgiving Day. The deployment orders for active-duty troops had been scheduled to end on Dec. 15. But defense officials tell NPR that the much of the active-duty troop deployment is expected to be extended into January and that part of the force may also be switched out for new troops. News that the deployment will likely extend through the holidays comes days after U.S. agents fired tear gas at migrants who tried to cross into the United States from Tijuana, Mexico, on Sunday. That event took place at the San Ysidro Land Port of Entry between Tijuana and San Diego — "the busiest land border crossing in the Western Hemisphere," as NPR reported. Earlier this month, Defense Secretary Jim Mattis said the troops are meant to support Customs and Border Protection agents and provide logistical help — everything from installing barbed wire to moving personnel to where they're needed. The troops include military engineers and military police, who are supposed to leave any actual law enforcement duties to CBP officials. 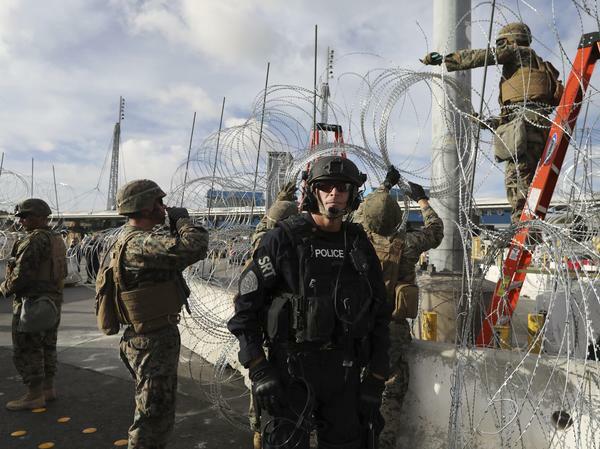 Some of the active-duty military personnel are being sent to the border without weapons, as Steve Walsh of member station KPBS reported last week, during a visit to Marines and military police along a fence at the line between the U.S. and Mexico. Armed members of the force guard the Marines as they work, Walsh reported. The military deployment came after the Department of Homeland Security asked the Pentagon to help its Border Patrol units along the southern border in October, planning for the arrival of a caravan of thousands of migrants from Central America. Trump's political opponents called the move, which came just before the November midterm elections, was called an overreaction — and even a stunt. In addition to the 5,900 active-duty personnel, the Trump administration has sent 2,100 National Guard troops to the border. When Mattis visited the deployed troops the week before Thanksgiving, he said, "I think that it's very clear that support [for] the border police — or Border Patrol is necessary right now." But he did not go into detail about why the use of active-duty personnel was required. The president has called the caravan's arrival an invasion. But as of earlier this month, Mattis and others were not using those kinds of terms to describe the situation. In April, Trump signed a proclamation to send National Guard troops along the southern border, as part of his campaign to cut down on illegal immigration — a key part of his political platform. When Central American migrants tried to enter the U.S. from Mexico this past weekend, Border Patrol agents fired tear gas. They said it was in response to being pelted with rocks and bottles. Military police from the Army are also deployed at the border but only in a supportive role. There were reports they could be home in time for Christmas, but that may now be in doubt. Let me bring in NPR's Pentagon correspondent Tom Bowman. And, Tom, remind us just the top-line number here, how many U.S. troops currently on the border right now in these supporting roles supporting DHS. TOM BOWMAN, BYLINE: Mary Louise, it was 5,900 troops. It's dropped a bit down to about 5,600 along with 2,100 National Guard troops. KELLY: All right, hang on. I'm doing the math. So that's just shy of 8,000 total. BOWMAN: ...Total - right? - active and Guard. And a deployment of the active troops was expected to end December 15. But what I'm hearing now is a large number of the active troops could stay beyond December 15 and well into January. They're working the details of it now. We expect to have more in the coming days. And Defense Secretary Jim Mattis was asked about all this today, and he just kind of said, hey, we're still working on it with Homeland Security. Let's listen. JAMES MATTIS: We work daily on it. Right now we have no new requests although we are discussing every day the situation. BOWMAN: Now although the secretary wouldn't get into it, I'm told by officials that some of these active troops - that 5,600 will remain. Others will go home and be replaced by other troops, right? And then there are some that will just go home and not be replaced. But the bottom line is you're still looking at a sizable active duty force into January. KELLY: And do we have any more clarity on what exactly they are supposed to be doing and whether quite that sizable a force is necessary to respond to the perceived threat at the border? BOWMAN: Well, some already have, you know, strung out barbed wire and put up barriers and so forth, and others right now are protecting the Border Patrol folks down there. They're sort of the third line of defense. But a lot of officers I talk with say, listen; you don't need 5,000-plus troops or even half of this, several thousand troops. BOWMAN: Seventy-two million dollars so far for the active troops. And they're saying, listen; you don't need that many. You could get by with maybe hundreds and so forth. But at this point, we just don't get a sense of what's going to be the final number. Again, it'll be in coming days. Now, Defense Secretary Mattis has defended this. He's saying it's not a political stunt as some have said. And the chairman of the Joint Chiefs, General Joe Dunford, also has defended this. But clearly a lot of people will be talking about this in January, particularly Democrats when they take over the House. KELLY: NPR Pentagon correspondent Tom Bowman - thank you, Tom.